My daughter, Shelby, is a junior at Innovation Academy Charter School, a public high school in Tyngsboro, MA. At the end of the year, they offer the students various choices of week-long "endersession" activities. These range from backpacking trips in Vermont, to theater tours in Boston, to various creative projects. 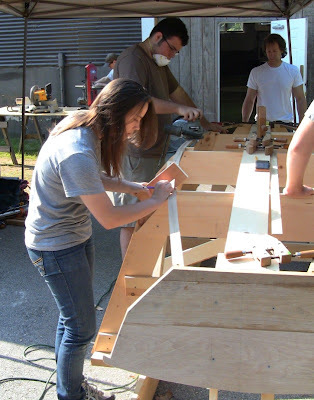 Shelby's choice: building the Harry Bryan dory skiff "Daisy", from Wooden Boat issues 126 and 127, Sept/Oct and Nov/Dec, 1995. Makes a father proud! Click on the covers to order hardcopy or PDF downloads of these issues. The left cover photo shows the Daisy a-building. 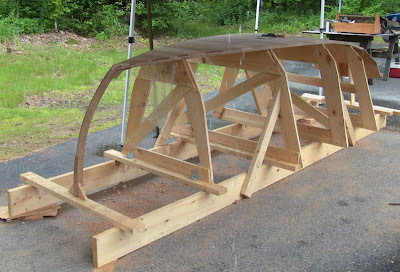 Building a boat like this is an ambitious project. There's hardly a straight line or square angle to be found. It's all sweeping curves and odd compound angles. That means lots of shaping with chisels, shaves, drawknives, rasps, and planes. It's built upside down by laying chines and planking on station molds. Then the shell is removed and the interior and topside work is done. 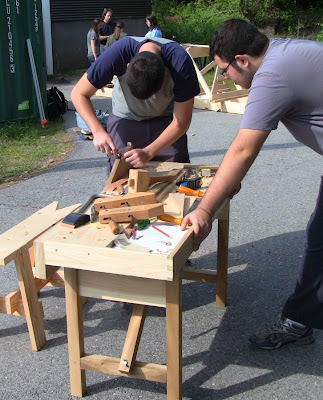 Add to that inherent complexity the fact that most of the students have little if any experience with tools. That makes for a challenging project, with many opportunities for mistakes that have to be dealt with. And of course everything takes four times as long under classroom conditions. But this is the true essence of education. Complexity, challenge, problem solving. 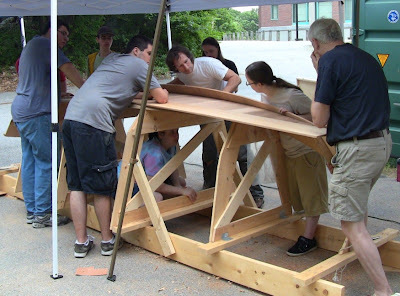 They knew they wouldn't have time to complete it; just building the ladder frame and molds took the first two days. The goal was to complete the planking and remove it from the mold. They got close, but didn't quite make it. Finishing it will be a project for next year. Teacher David Smith led the group, with help from several parents throughout the week. In addition to Shelby, there were 8 other students, though a couple were out sick part of the week. I didn't get a chance to talk to all their parents, so I'll just use some initials here for now, but the other students were Niamh (from the Gaelic, pronounced "Neeve"), Rick, Gustav, Jess, Chris, JH, BY, and ZM. 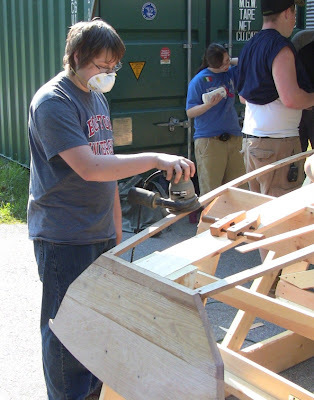 Mr. Smith spent seven years as a boatbuilder in Maine, New York, and Massachusetts before becoming a history teacher. I wasn't able to stay the first two days, but Niamh's mother, Colleen, was there those days, and her father, Chris, made it Friday. Arthur, a professional woodworker and father of a student in a different session, was also there most of the week. I took vacation the last three days to be there. 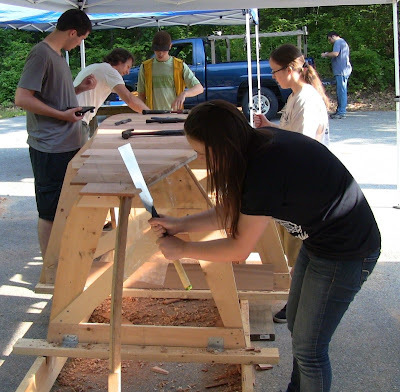 They had benchtop planer, tablesaw, chopsaw, bandsaw, cordless drill, several hand tools, and an assortment of clamps. I still had all my tools and portable Underhill workbench in my van after participating in the SAPFM demo in Newport Sunday, so Monday when I dropped Shelby off, I also dropped these off, along with another bin full of clamps (you really can't have too many clamps building boats!). I setup the bench and gave Mr. Smith a quick demonstration of how to use it's work-holding features with holdfasts. 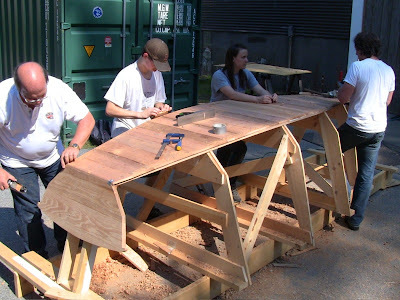 By Monday afternoon they had the first station mold mounted and had planed all the cedar planking to proper thickness. 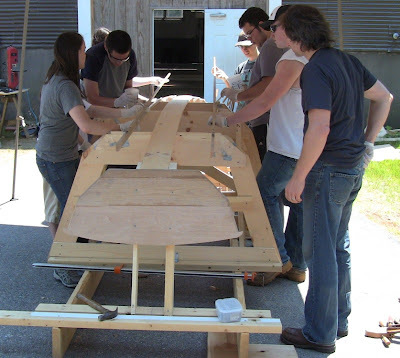 By Tuesday afternoon they had the remainder of the molds in place and had completed most of the transom and stem. 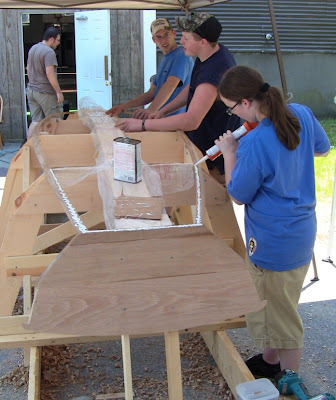 The task for Wednesday was getting the transom, stem, and chines, all of oak, temporarily mounted on the molds. 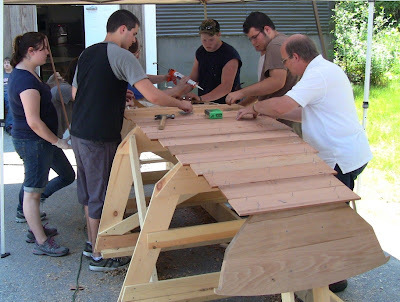 The transom and stem require careful work due to the curves and compound bevels that have to be worked. 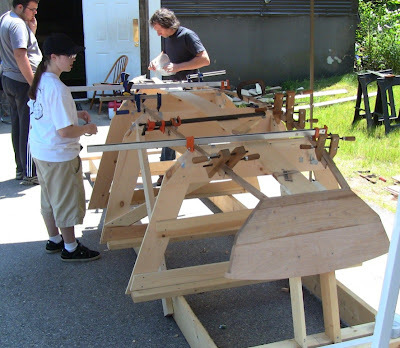 The chines (the corners where bottom and sides meet) in this design are split most of their length with the bandsaw to make them flexible, then clamped across the mold corners with epoxy in the split. When the epoxy cures, the chines hold the compound curves they've been fitted to. 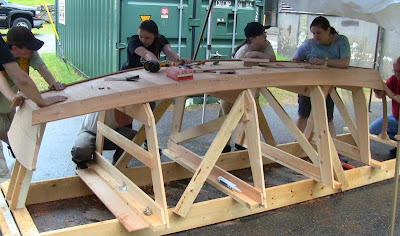 From left, Shelby, Mr. Smith, Jess, and Niamh with frame and molds, ready for the transom, stem, and chines. Note that for this design, the strongback runs across the top of the molds rather than across the ladder frame. 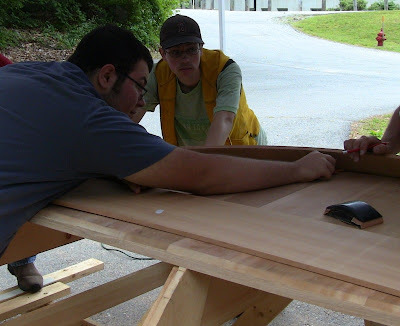 Chris finishes up the last segment of transom bevel with a spokeshave while Gustav steadies the bench. I told him you won't find much tougher stuff to work than oak end grain. 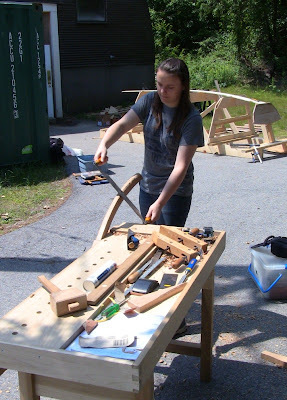 Jess learning how to plane a scrap of oak left over from the stem. I showed her how to thickness it with a #5, flatten the face with a #6, and smooth it with a #4, each step producing different characteristic shavings. 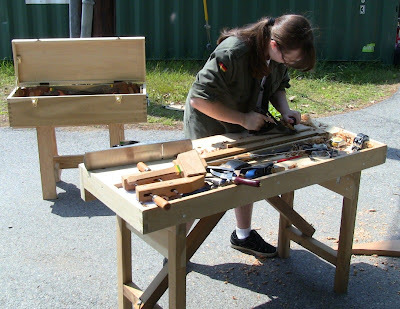 After I showed her how to shape the curve and edges with spokeshave and Shinto rasp, she said she wished the school had a woodshop, and spent the next half hour sculpting the piece. As always, making shavings is addictive! Shelby roughing in the bevel on the curved stem with my large drawknife. Mr. Smith was nervous about the kids handling such a large blade, but gave Shelby permission as long as I provided parental supervision. She followed up with a spokeshave, then I finished taking it down to the lines with shave, block plane, and chisel. 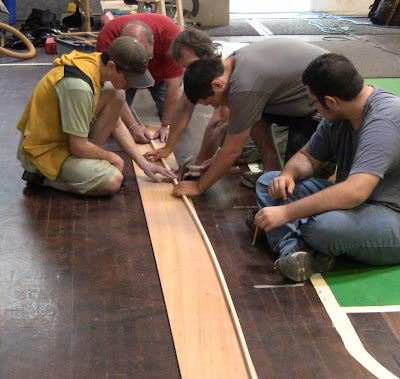 With the transom and stem temporarily screwed in place, the whole group working on the chine glue up, brushing the epoxy into the splits. Things start to get hectic once the epoxy is mixed, especially on a warm, sunny day to speed the chemical reaction. 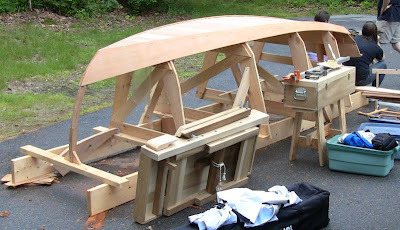 The chines clamped in place across the molds and screwed to cleats on the transom, with additional clamps to hold the splits together while the epoxy cures. Thursday's task was to bevel the chines and install the first layer of bottom planking. These run athwartships; the outer layer runs fore-and-aft, like the side planking. Mr. Smith holds a batten as a guide for Shelby to mark a fair curve for the top of the chine bevel. JH sands off the excess cured epoxy on the other chine. In the background, Jess is putting on sunscreen; it got to 90 degrees. Thank goodness for portable canopies, we never would have been able to work without shade. Shelby using a gauge block to mark the top edge of the chine bevel. While BY and Jess watch, JH and ZM practice beveling with a block plane and spokeshave. Beveling the chines to match the angle at the molds. This is a critical point: joining the chines to the stem at the bow. We hadn't brought them in close enough when the epoxy was wet, so once it cured they were a little too far apart. This required a bit of force to bring them together and screw them in, springing them out a bit from the molds. Jess applies marine adhesive to the top of the chines. 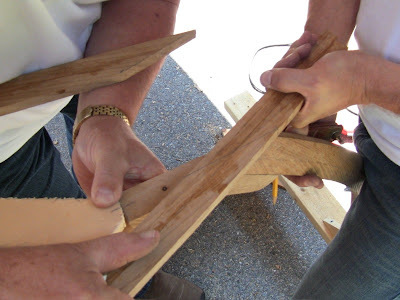 This will seal the joint with the inner bottom planks. Temporarily nailing the second plank to the strongback and chines. Halfway there. The mating edges of the planks have expoxy, so this all has to be completed before the batch of epoxy sets up. The plastic wrap keeps them from bonding to the strongback. From behind it looks like some kind of big fish flopped over onto the molds. After rough trimming of the bottom planks close to the chines with a saber saw, Arthur, Rick, and Shelby finish the day by doing some planing down to the chine bevel. Friday's job was to finish the bottom planking and get the garboard strakes on (these are the lowest planks on the side, meeting the bottom). 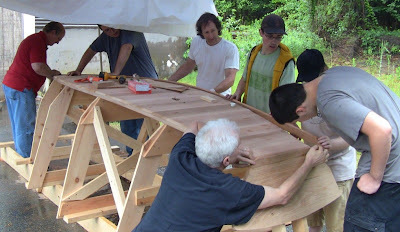 The bow section of the chines still needed to be beveled, and the last few bottom planks attached and trimmed. The whole bottom also needed to be beveled down to the chines before the garboards could go on. Shelby using a ryoba to trim closely to the chine bevel. The closer the cut here, the less time required to plane and shave it down, as the others are doing. Rick using a spokeshave to delicately trim the bevel at the very tip of the bow. 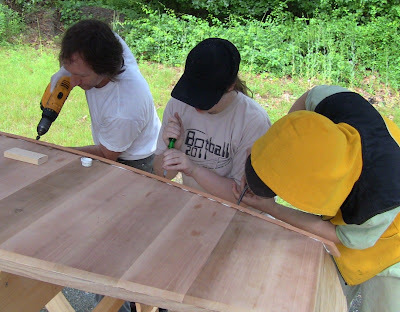 Bending the starboard side garboard into place for scribing. Niamh is underneath to mark it from the plank lines on the molds. 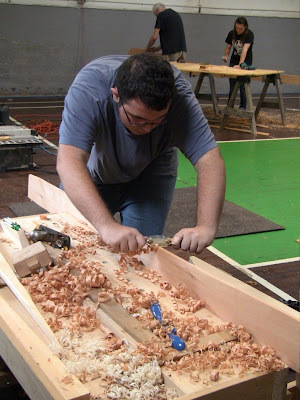 Gustav scribes along the bottom planks for the bottom cut line. Nobody move! 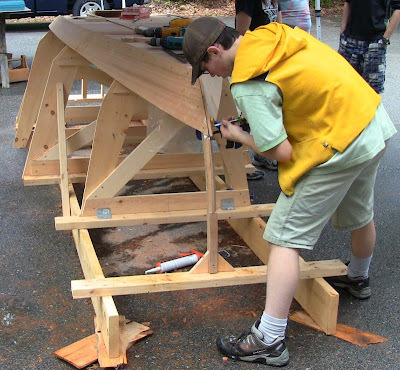 With a light rain starting outside, curving a batten between nails tacked lightly into the plank (but not the floor!). The batten defines the fair curve to mark the upper cut line. The bottom fully trimmed, ready to accept the garboards. Once again, the portable canopies allowed us to work regardless of the weather. 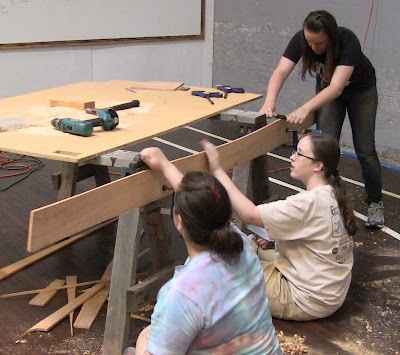 After rough cutting to within a quarter inch of the cut lines with a saber saw, Niamh, Jess, and Shelby trim down to the lines with block planes and spokeshave. 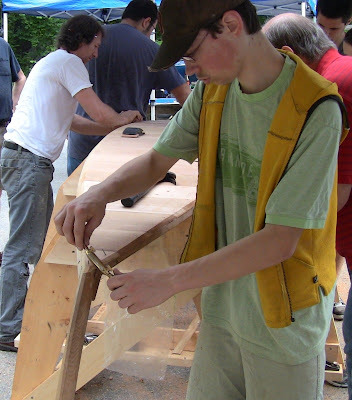 While Niamh's father works with Shelby in the background, Gustav works on the other garboard, perfecting the art of making long spills with a spokeshave skewed to the work. 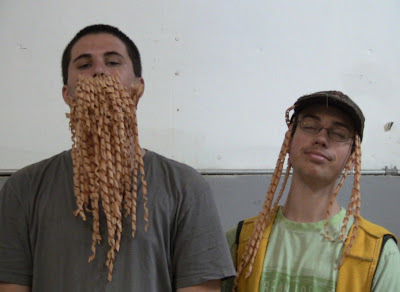 With the result that Chris and Rick appear to be in need of a barber. 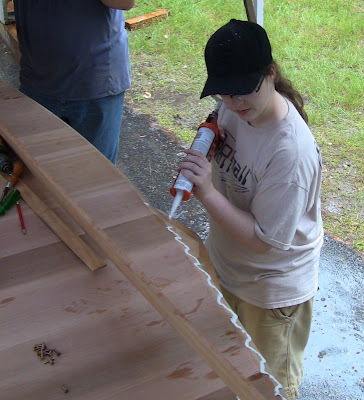 Jess applies marine adhesive to the chine and bottom edge. 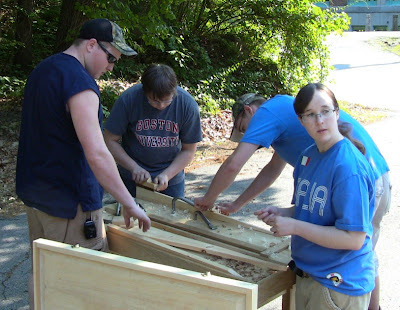 Preparing to secure the port garboard. This is geometrically counter-intuitive: the bottom of the boat curves downward from the center, while the garboard curves upward. 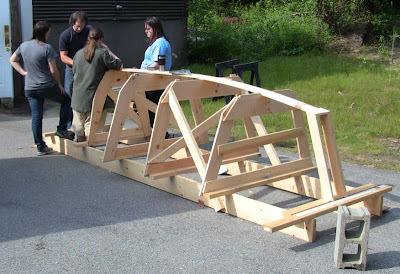 But bending it around another curve at an angle will match the curves. Bending the plank onto the molds and lining up the marks. 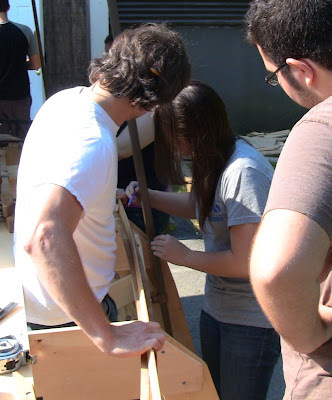 While half the group holds it in place, Mr. Smith drills pilot holes through the garboard into the chine, and Jess and Rick screw in brass screws. With the port garboard in place, securing the starboard side. Rick finishes the final screw at the bow. Packing up, out of time. 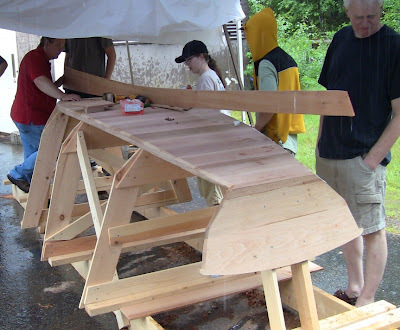 It would have been nice to complete the planking, but at least you can see a real boat taking shape. Below are some of my tools that I think were most effective on this project. It's not always obvious which specific tool will work best on a specific task, so it's nice to have a variety to try. The spokeshaves and planes were used quite a bit. The marine adhesive wasn't quite cured, so the tiniest gob would get all over stuff, but denatured alcohol cleaned it right up. From upper left: #5 jack plane with cambered iron, for fast trimming of chine and plank bevels. #4 smooth plane with Pinnacle iron, set a little fatter than for normal smoothing, did a great follow-up job on the bevels. Framing slick (the large chisel), had mass for finely controlled paring into tight spots. Veritas NX60 block plane, which took beautiful long endgrain shavings across the bottom planks. Shinto rasp, which just eats wood, whether oak or cedar. Ryoba, for close trimming in place. From lower left: ECE wooden block plane was great for endgrain. Antique Stanley cast iron spokeshave worked well shaping plank edges. Lie-Nielsen spokeshave was used on a variety of things, always working magnificently. The round thing in the photo above? That's what happens when you mix up too much epoxy in a round container; you make a hockey puck. That's not a hockey stick embedded in it, it's a solidified paintbrush. Put a bird on it and call it art! The kids rapidly figured out the Veritas block plane and Lie-Nielsen spokeshave were standout performers. They were arguing about whose turn it was use them next, not because they were shiny, but because they worked. 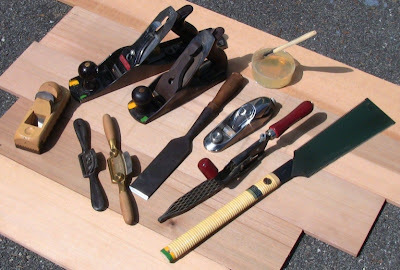 No surprise; these are some of the finest premium hand tools on the market. My fine Lie-Nielsen joinery saws were also in the toolbox, but Mr. Smith was worried about letting the kids use such high-end tools. My feeling is, they were meant to be used, so as long as they're treated with care and respect, I'd like to see the kids get the benefit of using quality tools. They could tell the difference. Good tools also make for good demonstrations. I showed a couple of the boys how to sharpen the slick. I had hollow-ground it the night before, so I showed them how to do 30 seconds each side on medium and fine India stones, then hard Arkansas, then green rouge strop. That got it satisfyingly shaving-sharp: one pass of the chisel flat across my forearm swept the hairs right off. I also went over safe handling of chisels with them; Arthur showed them the scar where he had opened up his hand once with a carving chisel. Sharp hand tools are not to be messed with! It was a blast working on this with my daughter as we head into Father's Day. I'd like to thank Mr. Smith and the staff at IACS for running it and allowing parents to participate. I think the students enjoyed it just as much. Oh yeah, I gotta try this at home!